Apart from the obvious sweat marks, you might think that there isn’t much in the way of bacteria and potentially harmful diseases in a sports facility, but you would be wrong. While it’s not always talked about, there are many diseases that can be picked up at the gym which come from improper cleaning routines and methods. Traditionally, a mop and bucket would have been enough to make your floors appear clean but these days, it’s common knowledge that using a mop is an ineffective method of cleaning. There are many different types of surfaces found at a sports facility and floor scrubbers can greatly reduce the number of labor hours your staff need to spend cleaning. While there has always been some debate about the use of floor scrubbers on wooden court surfaces, the evidence has proven that as long as there is no debris on the floor that could scratch the surface, then floor scrubbers are an effective way to clean them and remove bacteria. Synthetic floors, such as vinyl, are commonly used as a cheaper alternative to wooden floors. As such, floor scrubbers would be the ideal tool to clean these surfaces as they are fast, efficient and leave the floor behind them dry thanks to a vacuum squeegee. This means that the areas can be used again almost immediately. Bacteria and diseases such as Staphylococcus, athlete’s foot, colds, flu and MRSA all thrive in gyms and basically any sports facility. The risk of staff and visitors contracting diseases from these germs can be almost eliminated by using an automatic floor scrubber with an antimicrobial tank, or one that can clean floors using a chemical solution. Antimicrobial tanks remove bacteria safely as floor scrubbers remove dust and dirt from the floor. 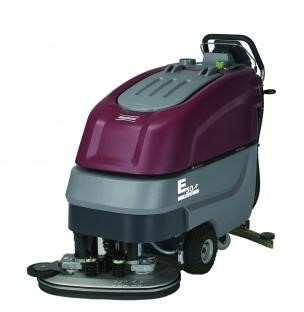 When looking at the different floor scrubbers for sale, consider how much space and room you have to manoeuvre a machine. For smaller spaces a walk-behind scrubber might be a better option than a ride-on one. Whichever type of machine you choose, an automatic floor scrubber is a great way that you can cut down on cleaning labor costs, reduce expensive chemical use and reduce water consumption. You’ll also be making your sports facility a safer environment for all who use it.